Disclosure: This is a review and a review product was provided in exchange for my honest opinion. Perhaps she hadn't tried using Dermagist Neck Restoring Cream? Made with special ingredients like peptides, hyaluronic acid, plant stem cells and various other high quality and precisely blended ingredients, it is designed to get results in 4 areas: Improving the look of very loose skin on the neck, targeting deeply entrenched wrinkles, instant-effect target tightening, and long-term benefits and health. 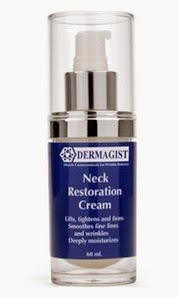 My opinion: I was given a bottle of Dermagist Neck Restoring Cream to try and although I’m not finished with it yet, I can say that it is very soothing, absorbs well, smells lightly of citrus, and doesn’t flake off. After two weeks, I feel that the skin on my neck is more supple and smooth. I really do like it! Advice: Don’t use more than a few drops at one time! It’s not a cream meant to slather like butter on toast! It’s made to absorb into your skin and work is magic down under the top layer! Guarantee: Dermagist has a guarantee in place to make you feel even more secure trying it! If you aren't 100% satisfied after 30 days, you can return the bottle for a credit. By then they're so sure you'll be so happy with it that you won't want to return it, but instead get another bottle! Price: Let's talk price. This isn't the most inexpensive cream around. But there are definitely ways you can pay much less. A simple one-bottle purchase from the company will run you $99.00 + shipping and 2 bottles costs less at $129.99 + shipping, which turns out to be less than $1.00/day because each bottle lasts for 60 days. Dermagist also offers regular shipment every 45 days for 20% off the regular price of $99.00. I have started noticing deep wrinkles around my neck. My mom really needs to try this out. I think it would help her. They have a guarantee and their products are geared toward aging women/men. Your review is very detailed and informative. Enjoyed reading it. I'll be 47 on Christmas Day and so I am eager to try new products in attempt to avoid the signs of aging as long as possible with such products, good diet and facial & neck exercises. I love that this is a neck product. I always try to do all the anti aging products and sunscreen and exercises on my throat and neck like I do to my face. I get the backs of my hands too. Robyn Donnelly+ Yes, the anti-aging market is huge considering one in three adults is now over 50! Yvonne Woodstock+, I think it's great that you are already starting to take care of your health and beauty now so you can stay that way into your 50's and 60's! I like that this product is for the neck area and that it has hyaluronic acid in it. It's never too early to start this kind of of treatment. I'm curious about this brand. Turning 50 this month really makes me look at my neck in a different way. Reading your review... well it's a no brainer. Help! janetfaye, yes I found out that hyaluronic acid retains moisture more than any other single compound! Happy birthday, Marnie Ward! Have a great one! I've kept my neck looking good with sunscreen and want to keep it nice with good products like this. I have been looking for a good neck cream for some time. This one sounds like a really good one. I'm getting up in age and I need to pay more attention to the care of my neck! Wow! I need this for christmas! Great review, I haven't started noticing any neck aging yet, but it is never too early to start to prevent it. I think I'm just beginning to see the effects of aging on my neck. Thanks to your review, I'll be giving this product some consideration. This product sounds like it works wonders for the neck!